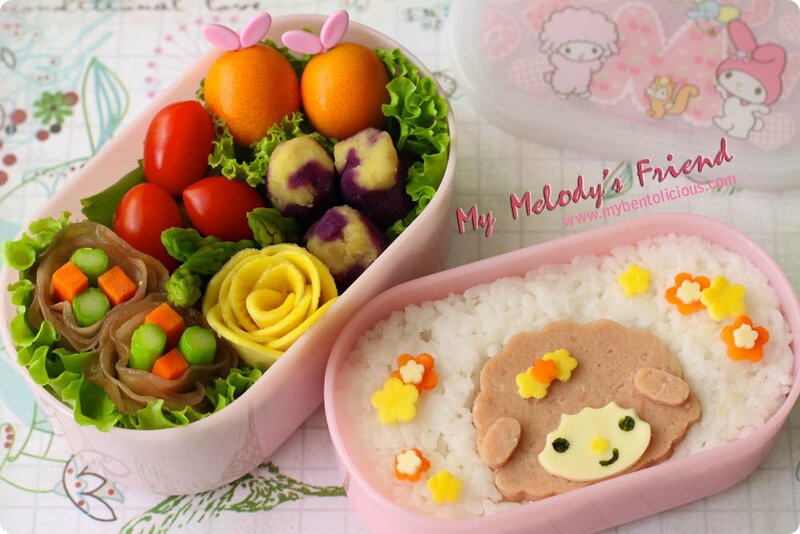 Today's bento was My Melody's friend called Piano. I made it from spam and cheese with egg and carrot flowers. It was easy to make with various cutters. In the other box, I put asparagus and carrot wrapped in thin slices of pork belly, egg flower, grape tomatoes, kumquats, and sweet potatoes flower. The sweet potatoes flower was made of sweet purple potato and sweet yellow potato. Steamed them first until soft and then mashed it with a little bit of vanilla milk. Then I combined the two colors sweet potato and shaped them. Tada ... I love the two-tone colors! Plus kids love to eat sweet potatoes. I like your 2 tone potato balls. Clever to combine the colors! Thanks for teaching us a new technique. Wow, it really looks like her hair! So cute! And how did you make the rose? Is it sweet potato strip? Those mini mini flowers are always my favorite! WOW! Another nice creation. So...So..pretty!! @Anncoo : Thanks a lot Ann for your nice comment! I bought some purple sweet potatoes but still can't figure what to do with them! Wow, the egg flower is so perfect! And I love the idea of mixing 2 colour sweet potatoes, thank for the tips! Did you cut Piano free hand? So nicely done! Please..(begging on the knee), show us how to make that lovely rose..^_^, love , love, and love it!! Always enjoy, browsing thru yr blog..always inspiring! The little flowers surrounding Piano are so delicate ! I love those, and the little carrot/asparagus wraps as well. I might have to steal that idea someday.